We are fortunate to have a few fossils from the Messel Pit in the Museum’s collection. Located near Darmstadt, Germany, the quarry was originally a pit mine for oil shale. Abandoned when the mine no longer was profitable, plans were made to convert the pit to a landfill. The site was eventually saved and declared a World Heritage Site by UNESCO because of the spectacular number and preservation of the fossils found there. During the Eocene, the quarry was a deep lake. The lake bottom, an anoxic, silty ooze, was toxic to bottom-dwelling fauna. With nearly 50 million years of hindsight, the inhospitable waters created an environment that guaranteed dead animals which had drifted to the lake floor were not scavenged and their remains mixed by the daily activities of bottom dwelling animals. The lake accumulated the remains of algae, bacteria, insects, spiders, fishes, reptiles, amphibians, birds and mammals – potentially anything calling the lush tropical forest home. A dark side to the fossil accumulation was spurred by releases of Co2 and hydrogen sulfide from the lake that poisoned and suffocated large numbers of animals living near the lake. 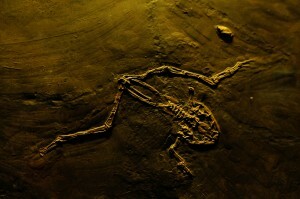 One of the most famous recent Messel fossils to come to light is Darwinius masillae or “Ida”, an early primate. Though well preserved, these fossils are extremely delicate. The shale encasing the fossils has a high water content and crumbles when dried. It wasn’t until amateur collectors perfected the technique of embedding the fossil in resin that they could be fully appreciated. This amphibian likely lived near the shore of the lake, burying itself by day and emerging at night to feed and mate. The stiff body posture hints at a last spasmodic leap from being poisoned by the release of toxic suffocating gasses from the lake.